I had Korean BBQ (KBBQ) with a few buddies for dinner. We had one of their combos, where we had banchan, seafood pancake, several types of meat (beef and pork), kimchi fried rice, and yogurt soju. Gogigui literally “meat + roasting”, or Korean barbecue refers to the Korean method of roasting beef, pork, chicken, or other types of meat. Such dishes are often prepared at the diner’s table on gas or charcoal grills that are built into the table itself. Some Korean restaurants that do not have built-in grills provide portable stoves for diners to use at their tables. The most representative form of gogigui is bulgogi usually made from thickly sliced beef sirloin or tenderloin. Another popular form of it is galbi made from marinated beef short ribs. However, gogigui also includes many other kinds of marinated and non-marinated meat dishes, and can be divided into several categories. Korean barbecue is not only popular among Koreans, but has gained popularity internationally. I ate the grilled meat with a lettuce wrap and banchan. Each person was also given a set of sauces to go with the meat. Here are some photos of our KBBQ! Gogigui comes with various banchan (side dishes), among which, green onion salad called Pajori and a fresh vegetable dish including lettuce, cucumbers, and peppers invariably accompanies meat dishes at restaurants. A popular way of eating Korean barbecue is to wrap the meat with lettuce and add condiments such as – pajori (spicy scallion salad) and ssamjang (a spicy paste made of doenjang mixed with gochujang). In American culture, primarily the Southern California area, “all you can eat” (AYCE) Korean barbecue restaurants have been greatly popularized by the large influx of Korean immigrants and their children. Prices generally range from about $10 to $20 US dollars per adult. These places usually provide a menu of meats that usually feature a variety of thinly sliced meats such as chadol (beef brisket) as well as the traditional bulgogi and Galbi. Many people use these restaurants as social meeting places where they can enjoy food, long conversations, and soju, a native Korean distilled beverage. 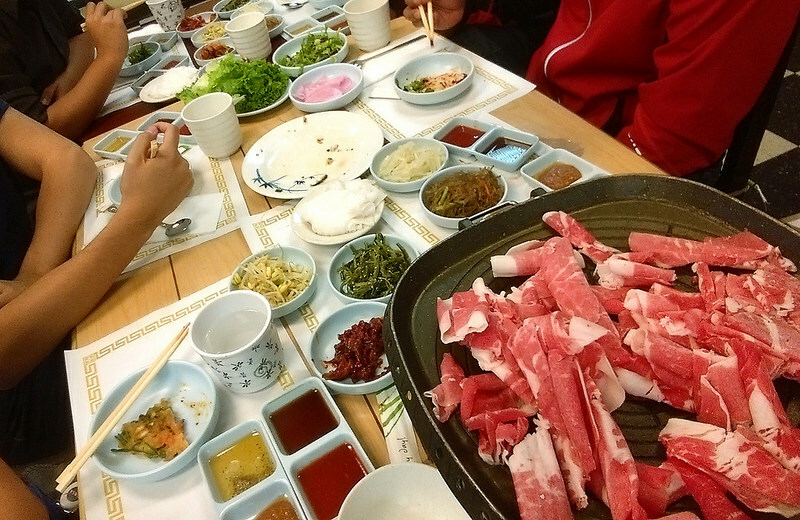 In Southern California, the best area to get KBBQ is at Koreatown. In Northern California, the area with the most KBBQ places is in Santa Clara, along El Camino Real.